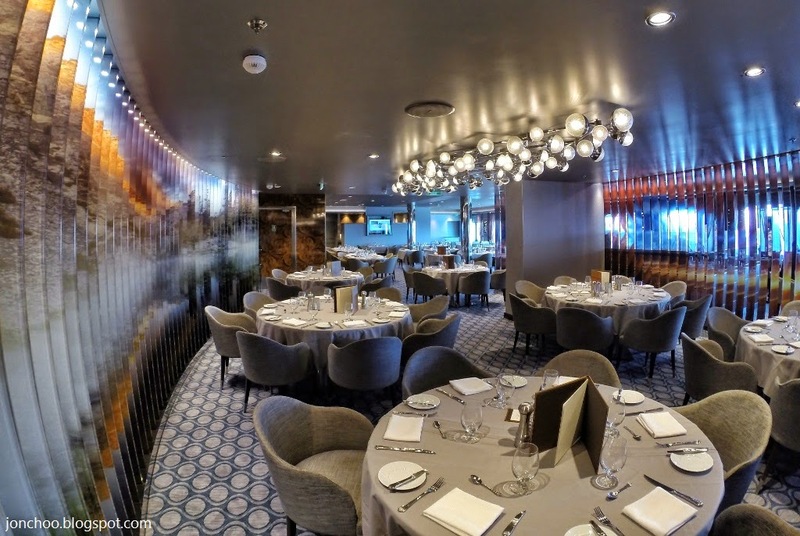 Last week my partner and I were invited to board Royal Caribbean's newest ship, Quantum of the Seas, at their pre-inaugural sail from Southampton for two nights. This was an event catered for the media, members of the press, bloggers, VIPs, travel agents and staff members. 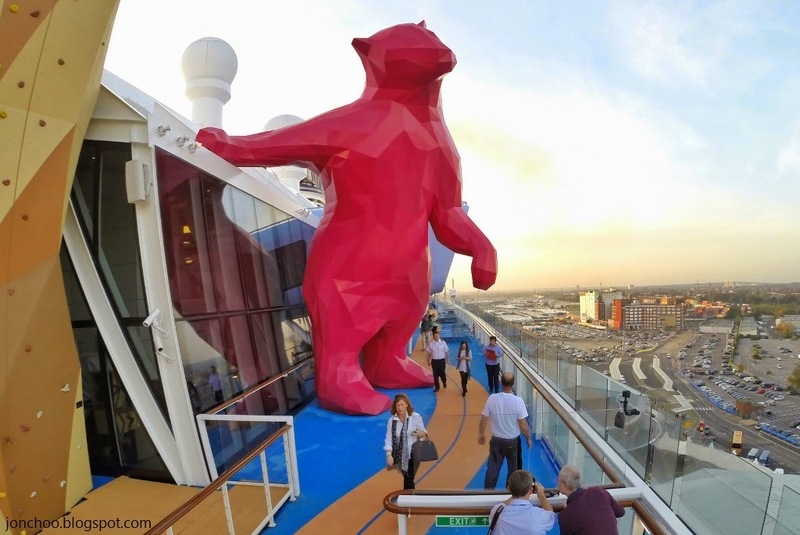 This was our first cruise so I had no idea of what to expect. The closest I have ever experience anything like this was in Vegas almost twenty years ago. A mini city resort on a giant boat is probably the closest I can describe this ship. 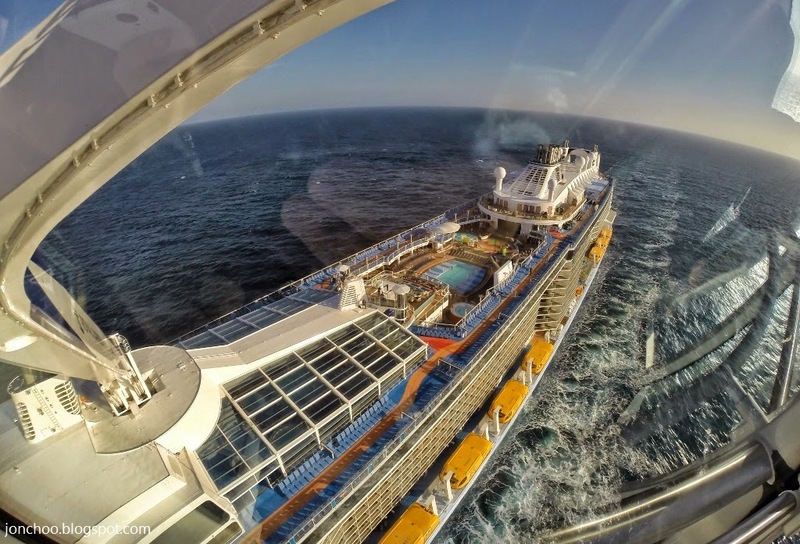 Quantum of the Seas is the first of a new breed of smart ships called the Quantum-class, and is currently the second largest cruise ship in the world, just behind Royal Caribbean's own massive Oasis-class ships. Read on for my impressions. We arrived at Heathrow Airport in the early morning of Friday and were immediately whisked towards Southampton by Royal Caribbean. Once at Southampton Port, we were greeted by numerous Royal Caribbean staff with Microsoft Surface tablets, who promptly checked us in. Only ten minutes elapsed from our arrival at the port, through security and to the inside of the ship. Suffice to say, we were overwhelmed by the taster cruise. Facilities were so numerous that it was impossible to test or rate them all, but try we did. Like excited kids let loose inside a chocolate factory, we set out to taste as much food from every restaurants as well as cocktails from every bar. It was impossible obviously, but I will do my best to describe all that we've seen in the two nights we were on board. 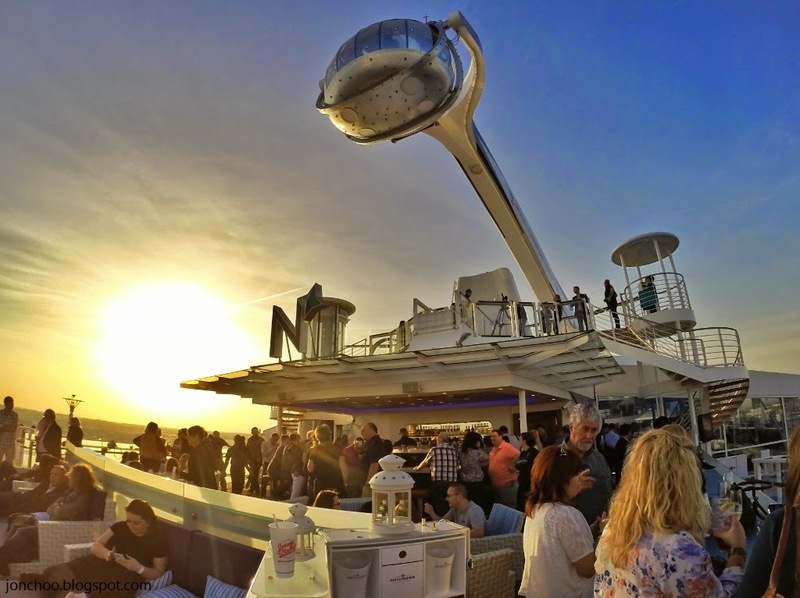 One of the new innovative facility on the Quantum class is the NorthStar, a London Eye-style observation pod connected to a crane arm that lifts visitors 95 meters above sea level, providing panoramic view of the ship below. 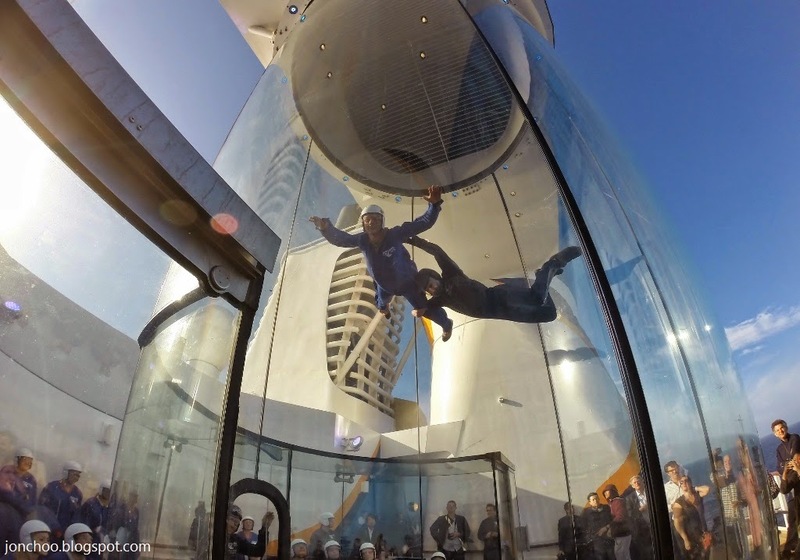 Other facilities includes the Riptide iFly - a skydiving simulator with its own wind tunnel, Flowrider surf simulator, rock climbing wall, games arcade, a running track, Adventure Ocean kids club and SeaPlex - a basketball court size court with bumper car rides, roller skating facility and flying trapeze. In addition to those, you have the numerous swimming pools on the open deck as well as indoor ones on H20 Zone, whirlpool hot tubs, sauna and steam rooms. 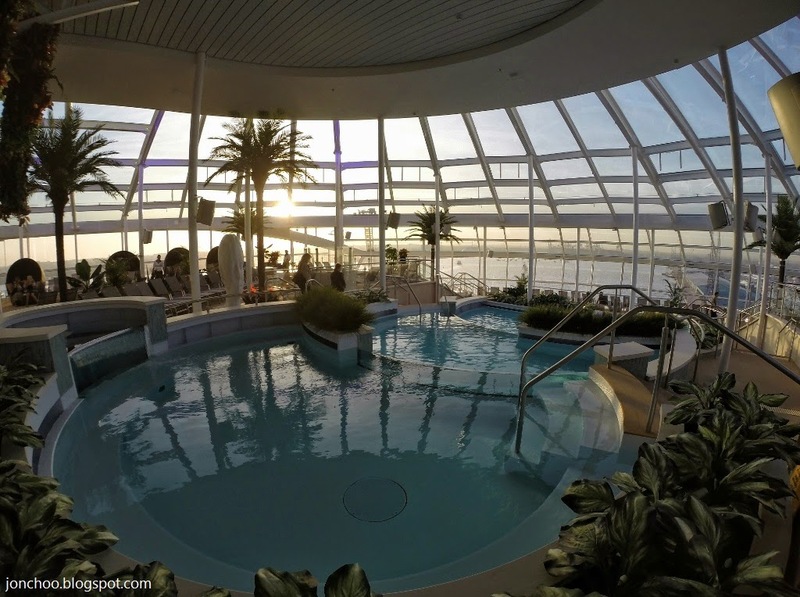 The Solarium, located on the aft of deck 14, is an adult only indoor pool area set in a massive green house like structure, and houses a couple of whirlpool and a bar. It is opened 24/7, as far as I can tell. 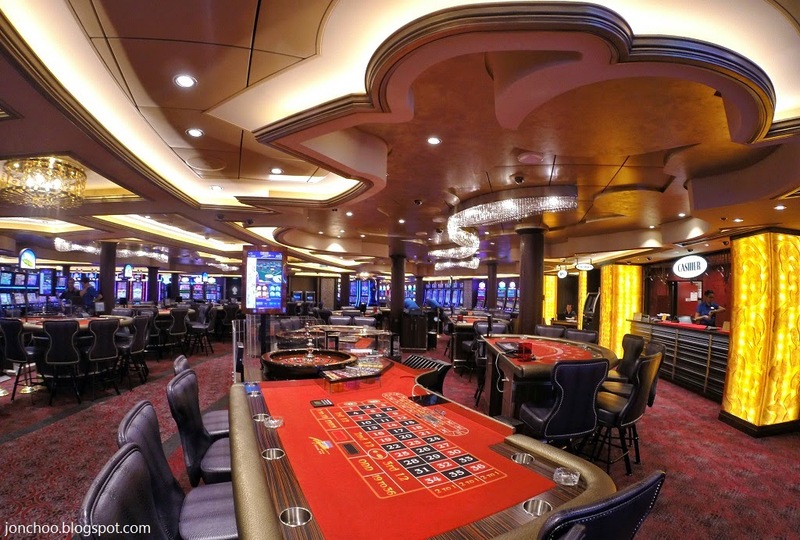 Below on decks 3, 4 and 5 you will find a casino, music hall, theater, shops, bars, pubs, numerous complimentary as well as fee-added restaurants. 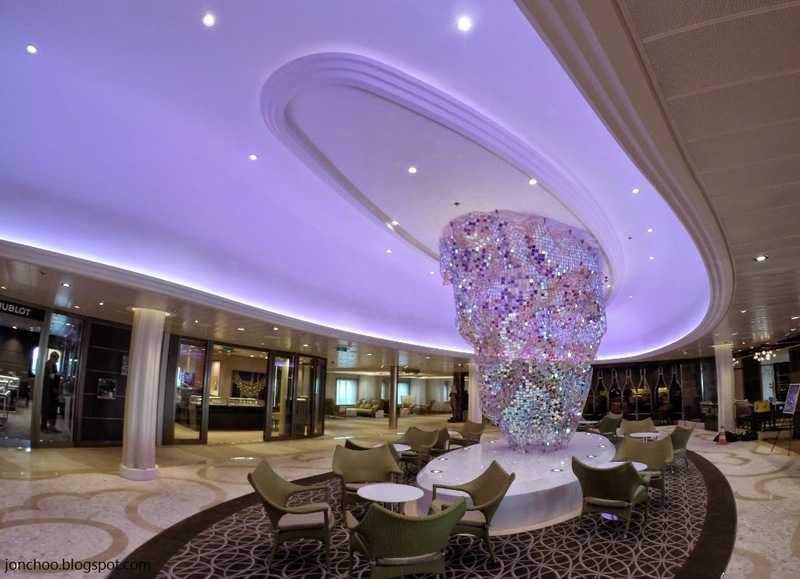 The interior of the ship can range from down right tacky to tastefully classy depending on your point of view. 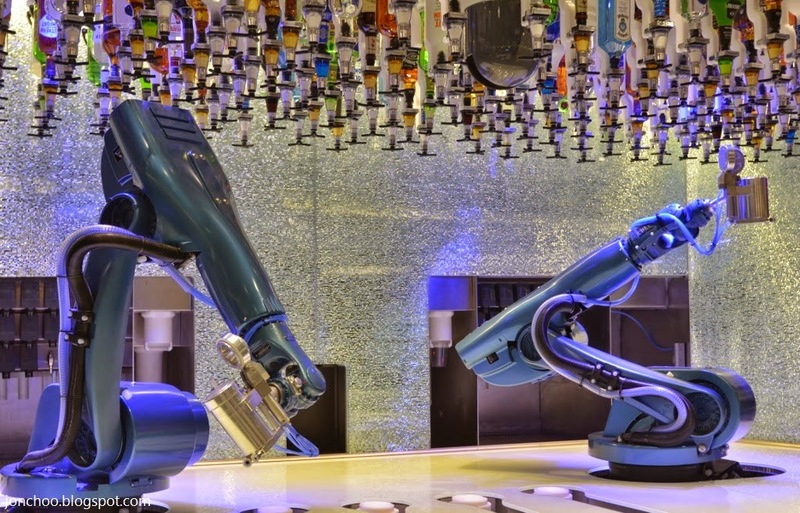 There are also two robotic bartenders at the Bionic bar, which while looks pretty sweet in demonstration, wasn't available for general use yet. Personally, while I found the technology impressive, nothing beats a seasoned and knowledgeable cocktail bartender. The four main complimentary restaurants are the American Icon Grill, Chic, Grande and Silk. With the exception to the Grande, we tried three of the restaurants. American Icon Grill, as the name implies, serves modern interpretation of classic American dishes. Silk is a pan-Asian fusion restaurant and Chic serves contemporary European gastropub food. 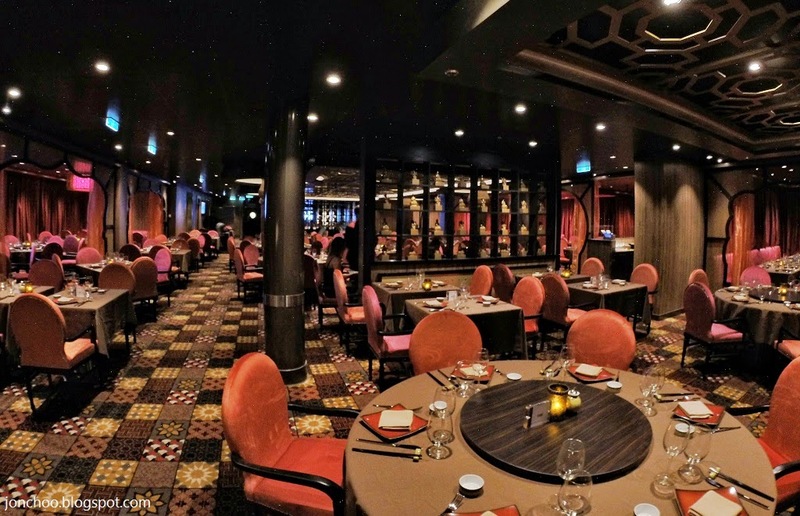 A 24/7 restaurant, the Windjammer Marketplace, can be found on deck 14. Other cafes are located on the promenade and opens up till late at night. 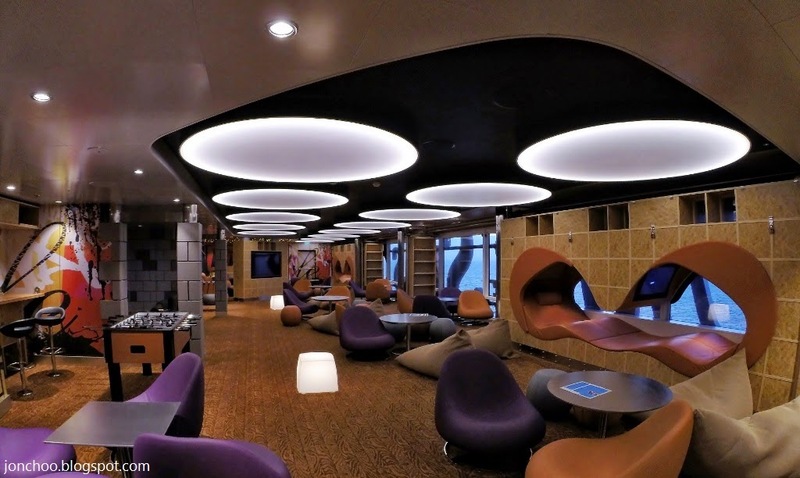 Perhaps one of the more exciting feature of the Quantum is the Two70° lounge on deck 5. 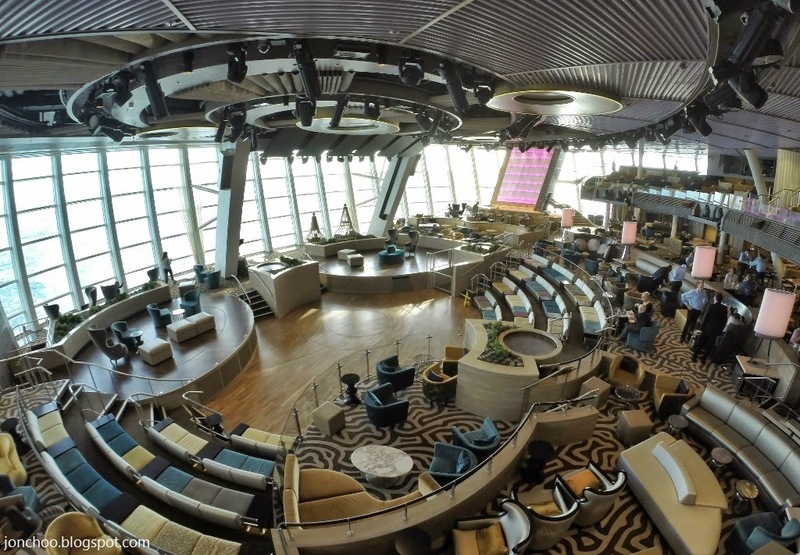 Three decks high, the lounge features a large 270-degree panoramic ocean view at the stern of the ship. 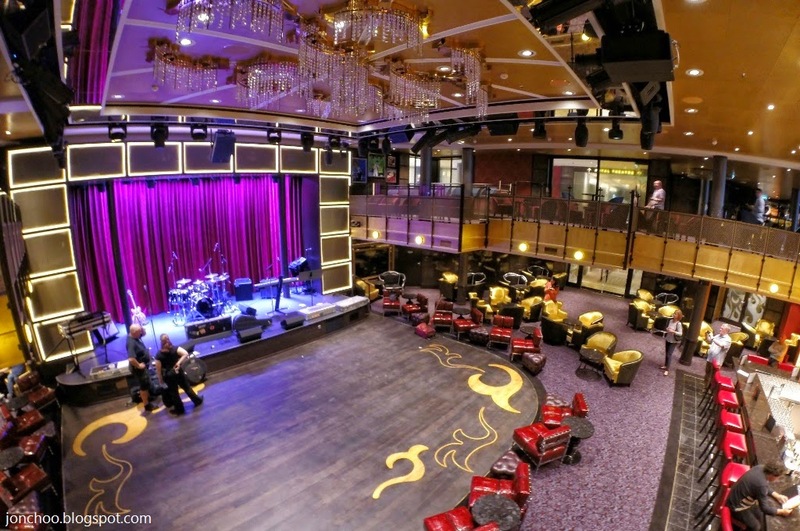 The lounge can be reconfigured as a performance venue for shows and disco. This is achieved by using a projector system that projects images to the window shades, and the use of five robot TV screens. We watched v, the Cirque-ish show with acrobatic stunts, which was still a work in progress. 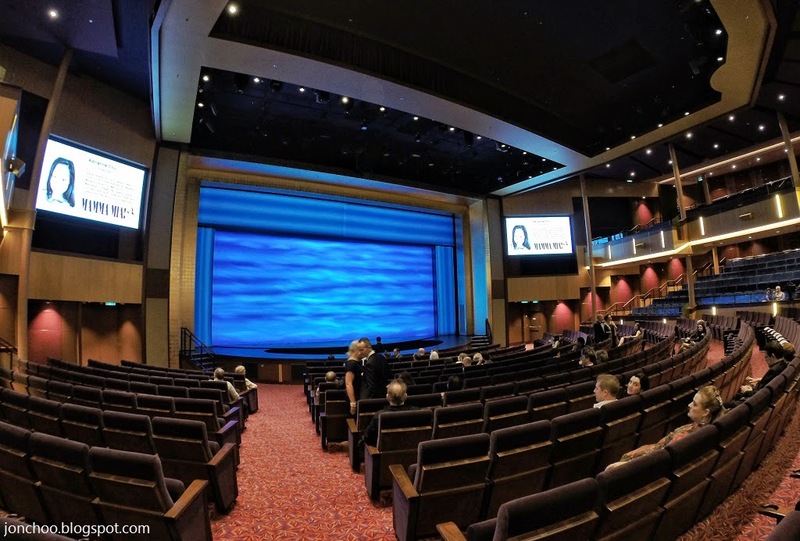 The Royal Theater is a large theatre and will house two musicals on Quantum of the Seas. The first is Mamma Mia, the award winning West End and Broadway musical based on ABBA's greatest hits. We watched the inaugural public show on the first night and found the musical to be a hit. The sea fairing version of the hit musical is the exact same as the Broadway and West End editions with no cuts or compromises made. 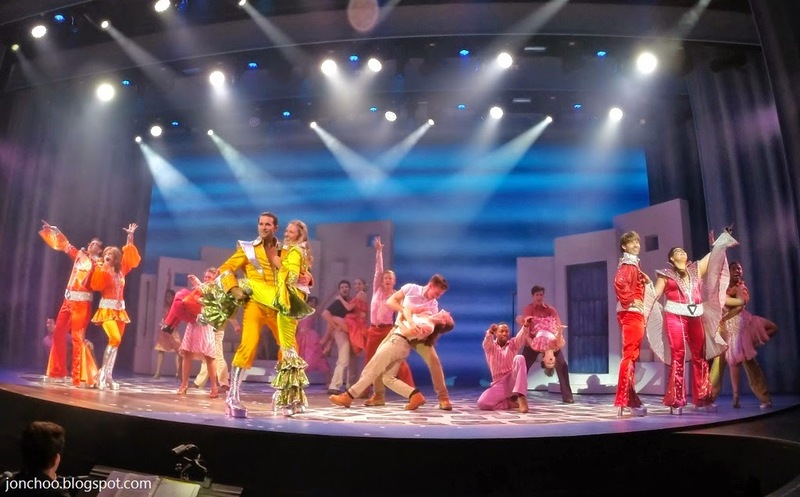 As Royal Caribbean appears to be a family friendly cruise (unlike say, the more adult Cunard line of cruises), I believe Mamma Mia will be a hit among both young and old audiences. The other resident show is Sonic Odyssey which won't make their debut until later in the month. Our room was a balcony stateroom for two on deck 10. The size is bigger than most hotel rooms I've stayed and comes with a large king size bed, shower room, a large TV which no one in their right mind will use, two USB ports on the desk so you could charge your phones and numerous USA sockets. The room attendant, a nice and friendly chap who has been with the company for five years, cleans the room twice a day, which we found unnecessary - but I was told is an industry standard. 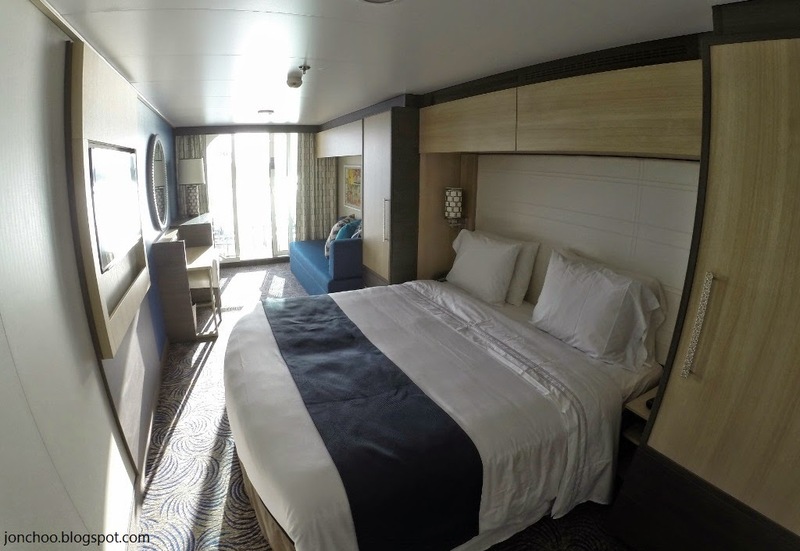 A couple of cabins were available for inspection including the new inner stateroom with virtual balconies (basically large TV showing a video of the outside). 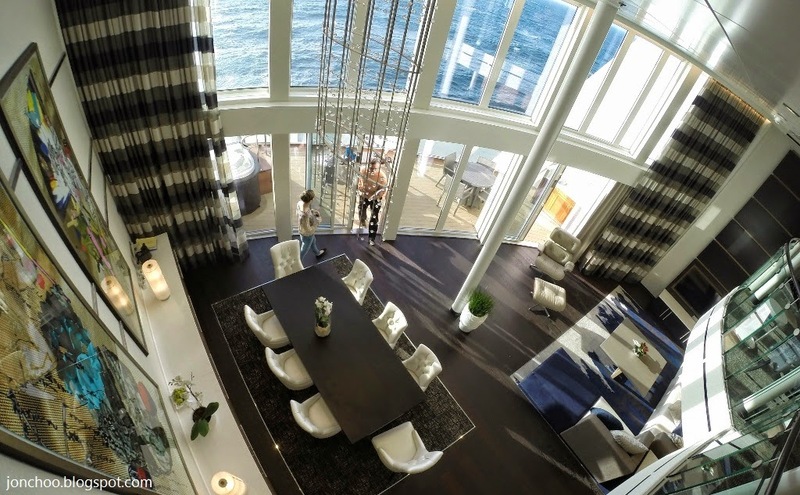 What we were most impressed with however was the 1600 sq ft Royal Loft Suite, a stateroom so large it commands the vertical space of two decks. With two whirlpool hot tubs, one bedroom with walk in wardrobe, a separate TV lounge/bedroom and a large open plan living space, the suite is also larger than our house! 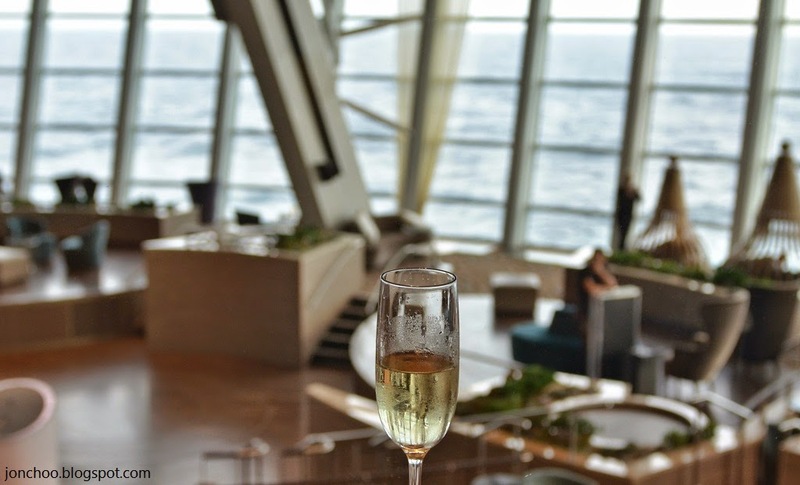 If there ever is a definitive definition of luxury cruise, this would be it. We were impressed by the two day sailing around the English Channel. There were however kinks to be ironed out and some parts of the ship were off limits as they were still building the interiors or fine tuning the electrical. The WiFi (which was complimentary on our trip, but is actually a paid for service) was often patchy and at times, next to useless, so it was difficult for me to e-mail or co-ordinate my time on the ship. This can be part explained by the presence of a large contingent of bandwidth hungry press groups on board. We found the mostly international staffs to be amazing and friendly at all times. At times, towards the end of their shifts, many were noticeably tired. It isn't surprising that there is a divisive issue among seasoned travelers over the need to tip staff members, considering the amount of work they do. Many are however happy to be transferred to this new ship as the staff facilities are an improvement over the older ships. Our time was short but sweet and while I still cringe at the cost of a cruise, I can finally understand why some are drawn towards them. 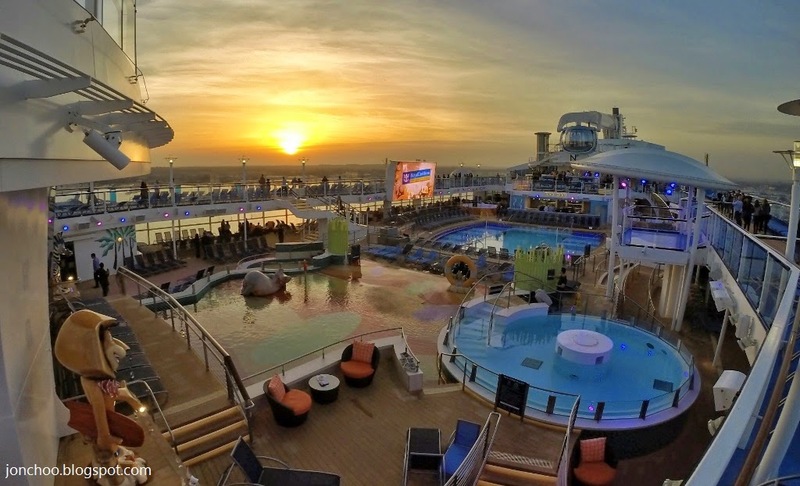 Royal Caribbean cruises tends to range from 5 to 12 nighs, and coupled with shore excursions, the numerous on board facilities and activities, it is not likely that anyone will get bored. 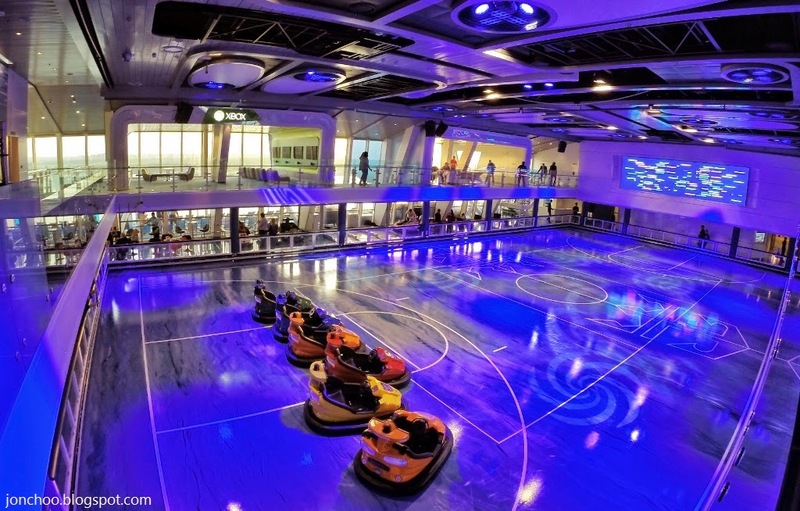 Without pretending that I understand cruise culture, we came away very impressed. In fact when we docked at Southmapton port on Sunday morning, we were hit with the biggest issue of all - we did not want to leave!